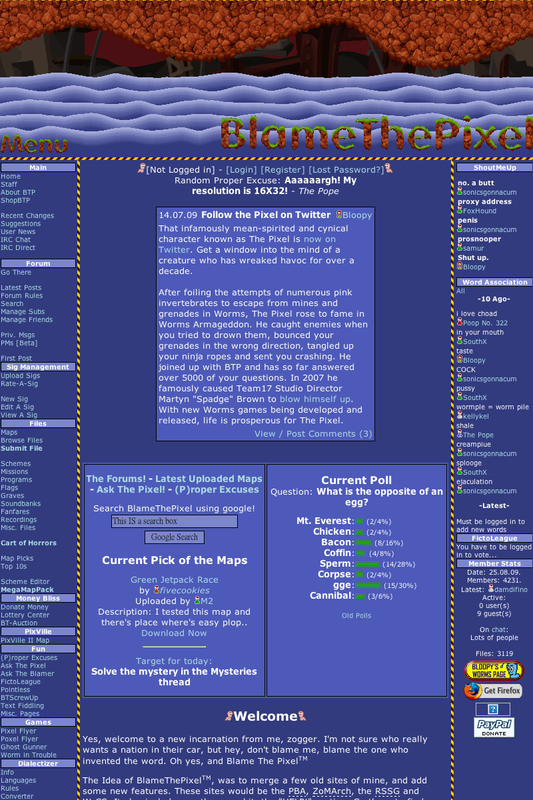 BlameThePixel (abbreviated BTP) was a general worming site, created by Zogger. The site contained a large community, along with a forum, downloads section and more. Due to a website issue which appeared between 2013 and 2014, it cannot be accessed at this time. The latest functional version can still be visited through the Internet Archive here. The site is still maintained by Zogger, along with an admin team including Bloopy, and others. The team has not yet approved to fix the known website issue. BlameThePixel was a combination of Zogger's previous sites - PixelBlamingArmy, ZoMArch, RandomSigScriptGenerator and Worms:ClanSites. The new site included a Help section, and in later years new featurs such as FictoLeague, PixVille and (p)roper excuses. This page was last modified on 7 April 2015, at 13:38.